Former First Lady Michelle Obama is committed to helping students reach higher by completing their education past high school. Now as a private citizen, she continues to celebrate College Signing Day through Reach Higher and the Better Make Room campaign to recognize the hard work of students to pursue and complete their postsecondary education, whether at a two-year school, four-year university or through an industry-recognized credential. Mrs. Obama encourages you to celebrate College Signing Day at your schools and in your communities. 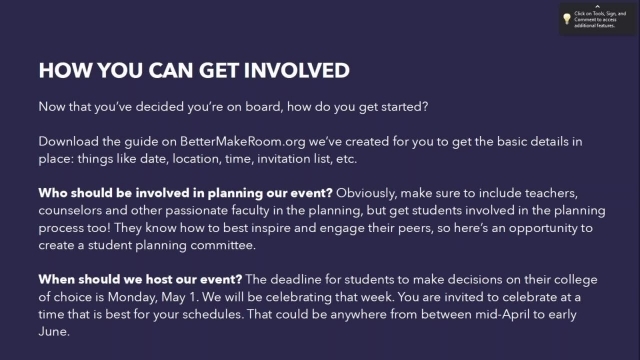 During this webinar, Reach Higher and Better Make Room will share a toolkit to help you host a signing day with your students and introduce you to new partners to help you make this your best signing day yet. Download the toolkit. Eric Waldo, executive director, Civic Nation’s Reach Higher, previously served as executive director of former First Lady Michelle Obama’s Reach Higher initiative at the White House, working to inspire every student to take charge of their future by completing their postsecondary education, whether at a professional training program, a community college, or a two-year or four-year college or university. Prior to joining the First Lady’s staff, Waldo served as deputy chief of staff at the U.S Department of Education for Secretary Arne Duncan.